Lori Winter was a swimmer in high school, and although most people would consider swimming a lifelong sport, after high school, she began looking for something different; something she could “do for the rest of her life”. It may seem odd to some that CrossFit is what she chose to pursue but after she began to explain, it made perfect sense. Enter CrossFit and it’s community, push and guidance. And, of course, the many challenges – even for someone with athletic prowess. CrossFit was the first time that she looked at a sport as “something she couldn’t do YET” instead of “something she couldn’t do”. It had the unknowns and gave her the chance to learn and contribute to not only her growth, but the growth of others. Kind of like that science stuff she’s into. What a great summer it was! The community at her gym back home in Colorado was exactly what she was looking for to fill the void of no longer being a part of a team. And then it was time to head off for her freshman year at SDSU – stepping out of her comfort zone for the first time to go live in a city where she didn’t know a soul, too far from home for a quick visit to see a friendly and familiar face. She didn’t join a CrossFit gym during her Fall semester, opting to go to the campus gym instead. But it didn’t give her fulfillment to workout there alone, the opposite of what she was looking for after her solitary swimming career. After a visit home over Christmas break and catching up with her old gym coaches and friends, she was convinced to take that second of many steps out of her comfort zone to check out Invictus for the first time. One of her core values is to always push herself and what she thinks are her limits. She actually looks forward to training at 6 a.m. and pushing herself through what she thought were her limits with her fellow Invicti. Whether it be moving to a new city, alone, as an 18-year-old; joining a new community at Invictus; or participating in Friday Night Lights for the first time, she’s game for the challenge! Her first experience with the Open was last year, but in class, and not under the lights at a large event with a huge crowd like the Invictus Friday Night Lights. But her coach, Kim, talked her into giving it a try, to push herself, and she reluctantly agreed – stepping out of her comfort zone once again. She admits that she was nervous all day Friday. She had never had done a FNL or a CrossFit workout on a stage and didn’t know if she was ready. But she showed up, ready to give it her full effort. It turned into a night of firsts. 1st heat – She didn’t have the benefit of seeing anyone else do it first. 1st time using a target for wall ball. 1st time using the 14 pound ball. She admittedly has always struggled doing wall balls unbroken and arrived at the gm thinking she would scale workout down to a 10 or 12 pound ball but she was quickly talked into trying the Rx weight by Kim and her judges. Her goal goal was to hit 5 rounds – something she knows she wouldn’t have been able to do it outside of FNL because of the support of the community. 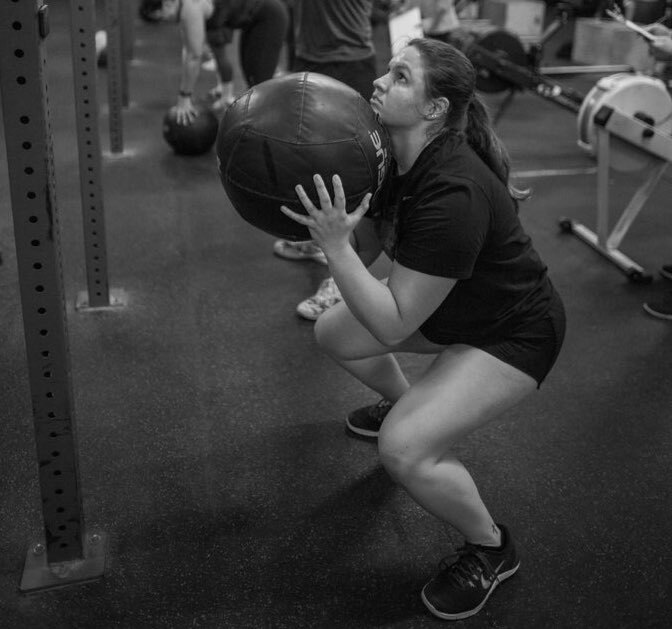 And she crushed that goal – WITH the 14 pound ball for the entire workout! She immediately committed to participating in all of the Open workouts – so no matter what comes up, she’s devoted to trying, even if that means scaling. She feels more comfortable doing the rest of the FNL now because she realized that the community just wants to see you succeed, no matter if you have to scale or how fast you go. Maybe it’s the mutual suffering. Even if you finish before someone else – it’s about going to cheer on that person who hasn’t finished yet and you’ll be just as happy for their score as yours. That mentality has poured over into her personal relationships as well. Her inspiration (and competition) growing up was her older sister. They both always did sports and were super competitive with each other. So what can we learn from this super sharp, 18-year-old who has “Pay the man”, a Josh Bridges quote (she’s a huge fan of his), plastered on her dorm room wall? Put yourself out there! Get out of your comfort zone! Find that one person to push you. Find yourself a community that you are excited about being a part of. Coach Kim’s Note: I moved to the Downtown location about a month ago from our Point Loma location and Lori was one of the first members of the original 6 a.m. Downtown crew that I had the pleasure of meeting. She always has a smile on her face and is an absolute pleasure to coach. Just like she expressed above, she is always willing to try new things and last Friday night was no exception. She was only slightly hesitant about using the 14 pound ball but with a little encouragement, she pushed through all 15 minutes of that workout and had an amazing performance. I can’t wait to see what she can do in the next four weeks!